The first bottle of ink I bought *for fountain pens* was Noodler’s Lexington Gray, and I would absolutely buy it again. I have to specify about when I bought it, though, because before my recent usage of fountain pens, I tried my hand (with minimal success) at dip pens. I bought ink for those, too, but don’t remember the details any more. Thank you! I also had a variety of good reviews to draw from when I was starting out. Now that’s one area that improved over the years. Even on FPN, few inks had reviews when I returned to fountain pens. I relied on phone conversations with Sam and Frank at Pendemonium for advice about which inks to buy. That’s probably why my early choices are still among my favorites and continue to be used year after year. I have a post about that subject that is almost finished and should go up this week. My current favorite is Platinum Carbon Black. Plat Carbon Black is a good ink providing the pen gets a regular cleaning. Even from the finest nib, it flows beautifully and makes a wonderfully dense black line. Which pen do you prefer with it?. The Preppy nib is excellent especially considering the price point. The pen is a good solution to any risk attendant with carbon ink. Good choice! Levengers Raven Black in the mid-1990s Still have it. It’s just a plain old black. At $15 for a 50ml bottle, it’s good value for money. 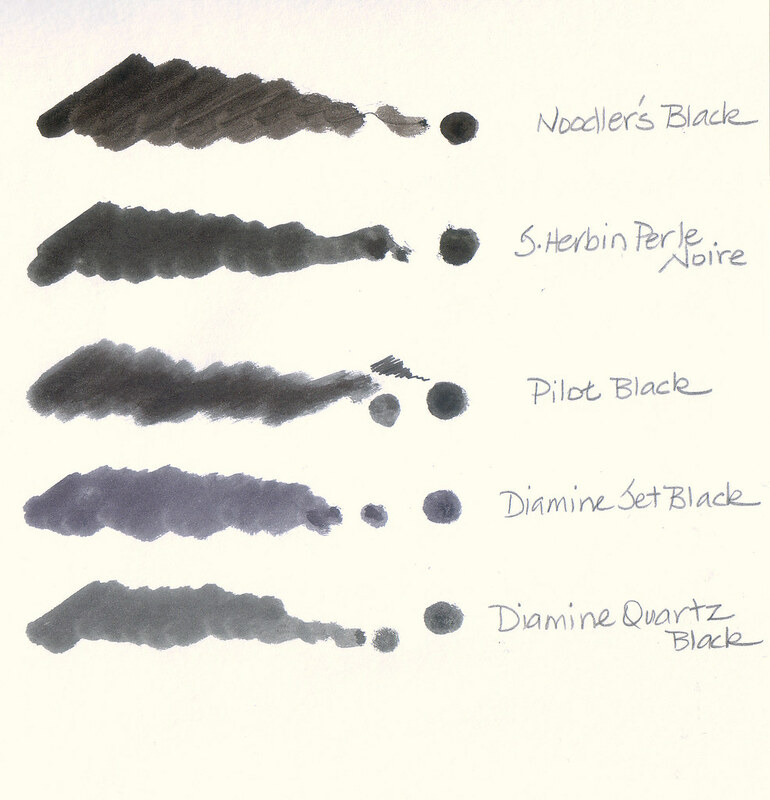 Rated as semi-permanent, Raven Black is a practical choice for a first ink. No wonder so many of us start with a black ink. Sheaffer Skrip in jet black, because that’s the ink my father used. My parents gave me, as a college graduation present, a sterling silver Touchdown Sheaffer Imperial in the diamond pattern with a fine nib, and there was no better way to put it to use than with Skrip. That was in 1973 — not as much variety as you can find now, in inks or pens, but we made do just fine. What a fantastic gift! My parents gave me luggage at graduation. You think it was a hint? Very likely my first bottle of ink, like so many others who started using fountain pens early in life (’60’s for me), would have been Parker or Shaeffer. 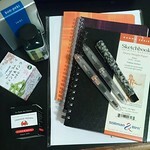 My first bottle when restarting use of fountain pens in 2011 was Diamine Evergreen. I now favour Sailor inks, but also like many others, like Aurora and J. Herbin. There is consistency with brands that people first use. Can’t go wrong with Parker or Sheaffer for quality and ease of use. The other brands you have graduated up to are some of the best on offer these days. In case you missed it, Sailor is greatly increasing its cost by eliminating the 50ml bottle for much of the line in favor of a 20 ml bottle at about the same price. Stock up while you can. Like you I appreciate J. Herbin Perle Noir (and also Aurora Black). There’s nothing quite like its lubricity. As to buying Parker or Shaeffer ink again, no, unlikely. Not counting the inks a friend gave me so long ago I can’t remember, and not counting the Winsor & Newton drawing inks that I purchased for a song (friend’s prices) and later gave to a friend for a suminagashi project, my first bottle of **fountain pen** ink was Diamine Shimmering Seas. And I have repurchased it when I misplaced the bottle. When I subsequently found it again, I was rather glad that I now had two bottles of it. Oh rats! I forgot about the Sheaffer No-Nonsense fountain pen I’d purchased when I was in high school. In that case, I’d have to say the first FP ink I ever purchased were the ink cartridges for my NN that were available back then. But the question asked was for **bottled** ink and I have to say that bottled ink had to wait another 36 years before I purchased it for fountain pen use. My first bottle of ink was Kon-Peki to go in my first fountain pen, my little Pilot Prera. Whilst I liked it, it didn’t blow me away, and only occasionally gets used. I now have many more inks but blue is still my favourite colour, and being an Australian I have easy and cheap access to Robert Oster’s many slight variations of blue (I’m partial to Bondi Blue and Soda-pop Blue.) I probably won’t get Kon-Peki again. Kon-Peki as a first ink is amazing and adventurous compared to most of us with our safe purchases of Parker and Sheaffer. You are fortunate to have easy access to Robert Oster Inks. Who needs anything else? My first bottle of ink was Waterman Purple, and I would buy it again. There have been many bottles since, and some of the Waterman Purple is left but low. I used some up trying to make Binder’s tanzanite. Oh, Lawdy! The Penman debacle. I’m still holding onto a bottle of Emerald but considering selling it. It’s so old though. My first bottle (as an adult)* was Waterman Violet back when it was that lovely stuff with the phenol smell. I have not purchased it again but then, I haven’t found the original and am sure I couldn’t. I purchased some of the new version once and found it uninspiring. I have found journal scribblings in that ink. It was special. Or at least, that time was special. *when I was a kid, Mom bought me Osmiroid pens and ink. Good for Mom! Did you enjoy writing with the Osmiroids? They do offer a variety of nibs which might have been fun to explore as a kid. I was in high school before I purchased a scratchy Sheaffer and a box of carts. I thought I was so lucky to make that happen. No wonder I didn’t return to FPs for at least fifteen years. The nib was not at all suited to my writing, but I did give it my best effort. I recall your fondness for Emerald and am surprised you have any remaining. Like you, I am uncertain about selling my stash due to its age. I got burned buying Ruby from an FPNer quite a few years ago and wouldn’t want to do that to anyone. It was so disappointing. As long as you have that bottle of Emerald, why not use it? The phenol Waterman was retired before I bought Violet. I used it once. Meh. However, inks used to write at special times, are special indeed. Fond memories are priceless. BTW, Karen, you introduced me to Diamine Sepia. I might have purchased my first bottle of it through you in a group purchase. Can’t recall exactly how that went now, but through the years, Sepia has remained on my list of favorites. It’s on my desk now waiting for a suitable pen, most likely the Conklin Duragraph 1.1 or a Platinum #3776 music nib. Both reveal Sepia’s wonderful shading and outlining properties. So thanks for making the introductions. It’s a relationship that has lasted longer than many marriages. Isn’t that saying a lot! My first bottled ink purchase was Waterman Florida Blue. It performed fine. I have not purchased it again because I prefer darker shades of blue. Diamine Evergreen, Diamine Graphite and J.Herbin Perle Noir quickly followed. Perle Noir remains in rotation, along with Platinum Carbon Black. My first FP was a Platinum Preppy. I later upgrade to the Platinum 3776’s, which are probably my favorite pens to this day. I was thinking of you this morning and wondering how you were doing. Good to hear from you. My journey was influenced by your journey, being a big fan of your blog! I have taken your reviews into serious consideration along the way. As for Waterman, I have stuck with the brand. Either the black or blue-black remain a constant fixture my stash. The 3776 music will be my next pen, for sure. Sorry I have been a stranger . . . lots of “life” happening here. I hope my blog has been a good influence and not just an enabler. Often as my pens run out of ink, there will be only two or three remaining and nearly always one of them has WBBk or WFB in it. Two other constants are Sailor Tokiwa-Matsu and an aqua or turquoise ink like R&K Blu mare. Again, contact me when you are ready to buy the music nib. As for “life” beat it into submission one way or another. You are the boss and sooner or later, it will discover that fact. Or something like that.